It’s been said that the French don’t do rock well, but they sure can do reggae. 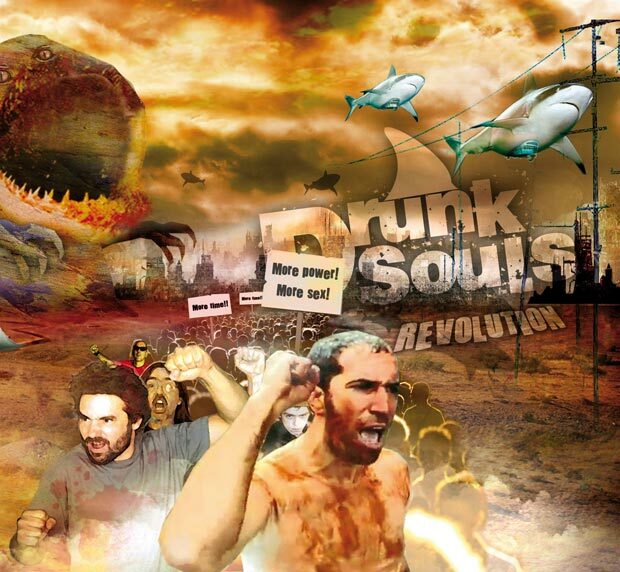 Revolution is the latest and best proof: a vibrant, intelligent, edgy, musically inventive album by a group called Drunk Souls. Consider it a reggae updating of Talking Heads as influenced by Manu Chao, touched by the mordancy of Tom Waits. You’ll love it. The vocals are mostly in English, sometimes in French, and once in a language unknown to me; written lyrics are provided. The disc opens with a propulsive rhythm that helps the singer wake up and face the world: “Damn, there’s a voice in my head trying to get me out of my bed.” Fortunately for us, he does indeed kick off his lethargy and becomes concerned about topics other than himself, as in the very next song, over a Bo Diddley-inspired variation on reggae’s one-drop and supported by an impressive horn riff, he sings “I got to find my place in this human race.” And so the quest for “a better heaven” begins, covering, over the next hour, a wide and disparate range of current phenomena from a viewpoint that is sometimes amusing, usually thought provoking, always original. And so it goes throughout Revolution: informed opinions on the state of human relationships expressed though multi-dimensional lyrics and creative musical settings, over as strong and varied a bunch of reggae rhythms as you could want. The disc even comes encased behind a photomontage that evokes the grim but lively paintings of Jerome Bosch; it’s clearly an intentional reference, and wholly appropriate for such a powerful, provocative album.